Best of Long Island and Central Florida: MM- Happy Birthday MAX! Happy Birthday to you Max !!! I can see you have a favorite "toy" to rest your paw on. This is one of Chase's favorites. I wish you a great day. Just know you will be spoiled, and you sure deserve to be. Many more Happy ones to you. Wish I could give you a birthday rub in person. You are a gem, and enjoy seeing you every Monday. Today is actually his birthday. We got a text from the Vet's wishing him a Happy Birthday- wasn't that so nice! So nice that the Vet sent him a Text. Now you will have to get him his own phone so he can receive his messages. :-). 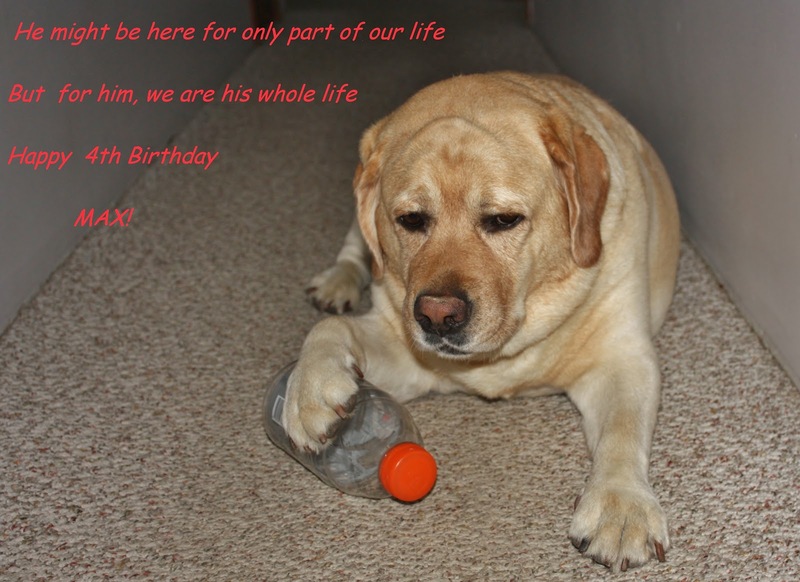 I hope he got a birthday walk on the beach. BTW......Chase sends lots of birthday sniffs. Happy Barkday from Chase. We both wish! It's summer and he's not allowed on the beach! I could get him there real early- like 6 am but like you I can't get him in and out of the truck. Chase will be there as fast as his limping legs can go. We are so lucky to have him, when I need love I can always depend on Max. Happy 4th Birthday Max. Luchia sends you lots of licks/kisses for your Birthday. We love you lots. Linda I feel our fur babies show and give us more Love then our humans do.Its unconditional too.. Thanks Cyndy and the girls! Max and I thank you for the birthday wishes! I never heard of a schapso. Where did you get him? Has he gotten better on the leash? Max is so slow ( he likes to go to NEW places but we stay on the same safe route) that it looks like I'm pulling him. He has to stop and read the doggie "newspaper" and it takes us about a hour to do a slow walk. Aw. Happy birthday! Such a cutie. Max & I thank you for the birthday wishes!